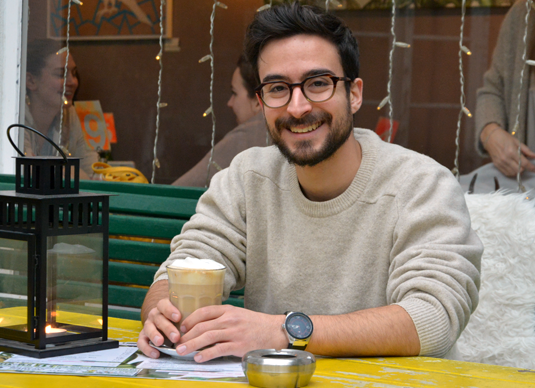 Flávio Amaral came from Brazil to Germany as an au pair. He stayed on to study and, thanks to his academic achievements and his social work, he has now been awarded the DAAD Prize 2018. When Flávio (27) heard that he had won the DAAD Prize, he couldn’t believe it. “I’m certainly no high-flyer. I’m just as highly stressed as all the others,” he says with a grin. It’s mid-November and the sinking temperatures give everyone a foretaste of the coming winter. Nevertheless, Flávio is sitting with his sleeves rolled up at one of the outside tables of a café. He isn’t one who shies away from difficulties – and it takes more than an autumn wind to disturb his equanimity. A native of Brazil, he has lived in Germany since 2014 and he now feels at home here. He knew very little German when he arrived, but he now speaks the language fluently, without a detectable accent. He is soft-spoken, but he undoubtedly has a special talent for languages. In addition to German, Portuguese and English, he also speaks Hebrew, Classical Greek and Latin – and has earned top marks in all of them. Learning the latter three was not entirely a matter of choice. They came with the subject he decided to study. Few would guess that the young man casually sitting there with a cappuccino in one hand and a cigarette in the other is an aspiring priest, and has been studying Catholic Theology at LMU since 2016. His path up to this point was anything but direct. Back in São Paulo, Flávio studied Social Science, and when he graduated he thought of taking a degree in Electrical Engineering. “My student advisor at school had recommended the subject to me, because she believed that one couldn’t make a living as a graduate in the Humanities. But I wanted to do something in the area of Social Studies, and since I’m stubborn I went through with it,” he says, stubbing out his cigarette in the ashtray. It had actually gone out some time ago, but he hadn’t noticed. For when he begins to talk about his work and his studies, he soon forgets everything that’s going on around him. The size of his future paycheck is obviously not what was uppermost in his mind when he embarked on his studies at LMU. But then winners of the DAAD Prize are honored not only for their academic attainments, but also for their contributions to the wider community in which they find themselves. Above all, Flávio wishes to give something back. He has been very fortunate in his life, he says. In Germany he was received with open arms. During his time as an au pair in Neu-Ulm, he helped out at a local social center for refugees. In Fürstenfeldbruck he was involved with a youth center, where he advised and helped children and adolescents. And in the seminary there are regular Essensgäste-Feste, during which the budding theologians prepare meals for, wait on and entertain homeless people. “Voluntary work is not only a matter of helping to meet basic human needs, it’s also a matter of simply devoting some of one’s time to others,” That’s why these occasions are always so much fun, with Bavarian music and all the other things that are part-and-parcel of Bavarian festivities. In his free time he also enjoys listening to Bavarian folk groups, such as La Brass Banda. But his favorite musical genres are techno and rock. “I was not very religious when I was young. My stepfather was a member of a Free Church, and religion was a very serious matter. Alcohol was forbidden and rock ’n’ roll was the Devil’s music.” And because critical ‘why’ questions always provoked the response “because it is the will of God”, Flávio finally rejected his stepfather’s creed. He remained a believer, but according to his own lights. That began to change during his studies in São Paulo, where he found a Catholic fellow-student who was able to answer the questions he posed. Flávio appreciates the fact that his theological studies and his colleagues in the seminary allow him to contend with his beliefs while remaining intellectually critical. He hasn’t yet made up his mind whether he will go on to be ordained when he completes his studies, but he fully intends to finish the course. – As mentioned above, he is not someone who gives up easily.